Solid furniture grade beech hardwood mini 18" baseball bat display case cabinet of beautiful design and construction. 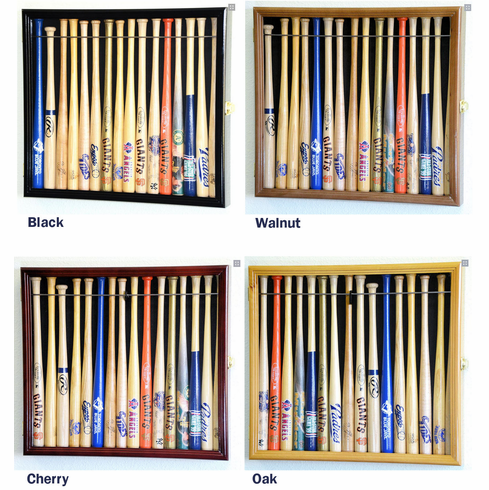 A perfect solution to displaying your memorable mini 18� baseball bats. An acrylic (98% UV protection) framed door keeps inquisitive fingers away, as well as dust! Black felt fabric background gives added contrast. This unique large cabinet holds up to 16 mini 18� baseball bats. This fully assembled display case is completed with brass hinges, lockable door latches, and heavy duty wall hanging hardware (bats pictured are not included). Unit Weight: appx. 7 lbs. Outside: appx. 19.5"H x 21.5"W x 2.5"D.